SeparatedBitPlanEncoder and MixingBitPlanDecoder implement a simple but powerful encoding scheme (especially useful for RGB images). 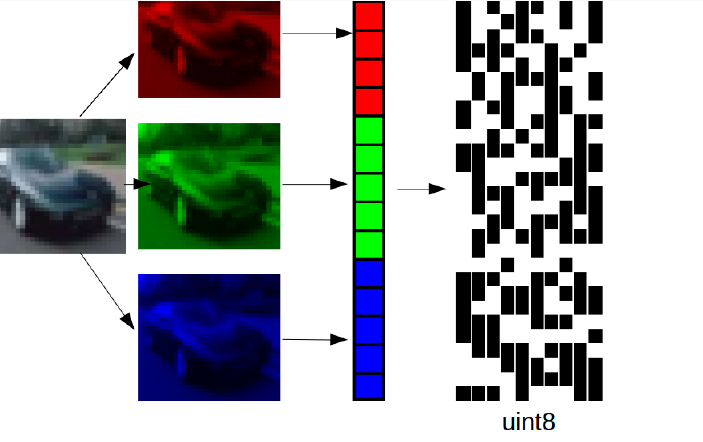 Let’s take an RGB colored image: it is composed of 3 channels (red, green and blue) of the same width and height of uint8. 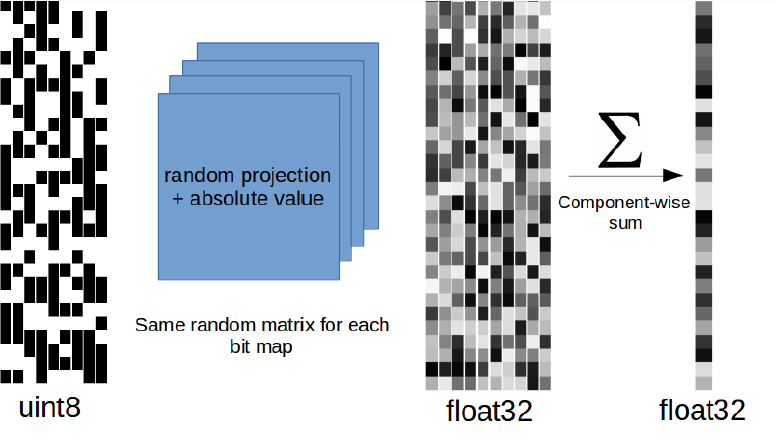 The SeparatedBitPlanEncoder flattens and concatenates each channel and builds the binary representation of them. We start by explaining what happens with the default setting n_bits=8 and starting_bit=0 and an array of uint8 in input. The encoded sample has shape (16, 3). This is the unpacked bit representation for each element, with bits going from the most significant (MSB) to the least significant (LSB). You can see that we just reversed the order of the representation. We have switched axis 1 and 2, the representation is now on columns. In the end we get a representation were the columns are concatenated n_bits representation of each feature of the samples. Note that here we set decoding_decay\(=2\), but when using the OPU, where the random features are in \([0, 255]\), you need to use \(0.5\). The decoded sample returns to the original shape (2, 3) [n_samples, n_features]. n_bits must be set to the same value used for the encoder, otherwise an error is raised. The parameters n_bits and starting_bits defaults can be changed. This is useful if you notice that certain bitplanes are just noise and you want to throw them away.